TouchPoint is a Sales Funnel Management tool. Regardless of which part of the funnel you are responsible for, TouchPoint helps you increase engagement & increase sales conversions. It is an entirely new automation tool for new business development, Sales Development Reps & Sales Teams, Account Managers & Customer Success Managers. It has never been done before. 1. Non Spammy warming of cold prospects - TouchPoint warms Warm cold prospects in a non Spammy manner– they get to know you & your company – They feel comfortable connecting. 2. Improves Engagement of potential prospects - Makes it easy for you to engage with them with familiarity via email & phone. 3. Updates Old Leads - If any of your cold leads are out-of-date, TouchPoint updates their contact information. 1. Helps Unblock funnel – Alerts you when Champions and Deal Blockers leave. You can add all people in the decision making phase of accounts to a list. Alerts you if anyone in the decision making phase changes job. Gives you a chance to reconnect and try closing the deal. 2. Gets Monthly mindshare from decision makers - in an automated manner. Helps you appear to be persistent, not a pest. Remind them and move them toward deal closure. 3. Monitor your competition's customers - Alerts you when any customer of your competitor leaves, so you can reach out to the new decision maker and replace your competitor. You can also monitor your competitor's rep.
1. Gives new high converting leads – Alerts you if any of your customers change jobs. The job switchers can be a high-conversion lead opportunity for your new business development team. If they've bought from you before, there's a good chance they will buy from you again. 2. Protects existing customers from competition – Alerts if any of your key supporters in any of the accounts changes job. Your team can also reach back to customer company to find replacement before new management starts working with a competitor. 3. Helps in getting Renewals - Alerts you when users leave, so that you can reach out and engage new users. Helps you get regular mind-share of management, so that they are still engaged when it's time for renewing the deal. 4. Monitor users - Helps you keep track of users, because eventually users become decision makers and then they can buy from you. Get 7 days of profile-advertising for free! Import from Purchased Lists, Excel, CSV, Salesforce / Any CRM, Web pages, LinkedIn® Searches. 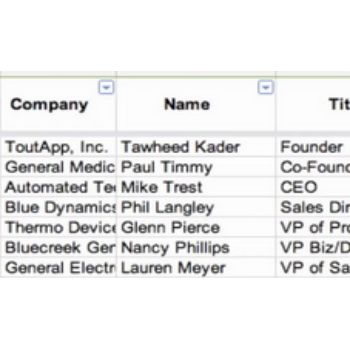 TouchPoint periodically checks for Title and Company changes. TouchPoint also leaves your photo and headline impression on the target profiles - helps warm up your leads. 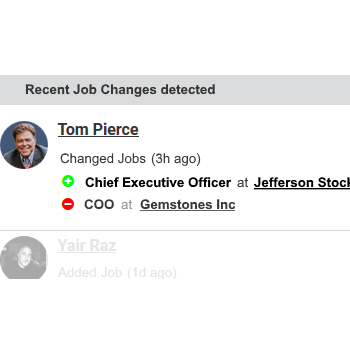 TouchPoint sends you daily email alerts of Title and Company changes it has discovered. You can also find the new business email address and phone#. You get new connection requests and look-backs from interested prospects. 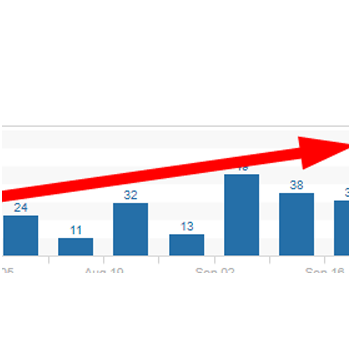 TouchPoint increases traffic to your LinkedIn profile. You engage only those who show interest. Here are some workflow scenarios where TouchPoint is unique & different. Advertise to exclusive LinkedIn Groups you are not part of. TouchPoint enables you to impress your pitch to decision makers and influencers in exclusive LinkedIn groups which you otherwise can't get access to. You can even export the list of people and add missing email and phone. Advertise to a mass market and only follow-up on people who have shown interest. If you have a market with 10K-50K prospects, use TouchPoint to advertise to them. Only follow up on those who look back at you. Deep mine companies which are less than 5,000 people in size. List vendors like discover.org don't have adequate data on smaller companies. With TouchPoint you can target deep inside departments of small and mid-size organizations. Track deal blockers : every B2B sales person has to get past deal Blockers to land new accounts. These are people who are blocking the deal from going through citing budget, timing, authority, or other constraints. TouchPoint can help you track these blockers and notify you when they leave, so you can go back and close the deal. Convert more purchased leads to sales. Data providers have high licensing costs. Use TouchPoint to double engagement, ROI & sales from purchased lists. Here are some technological areas where TouchPoint is unique & different. 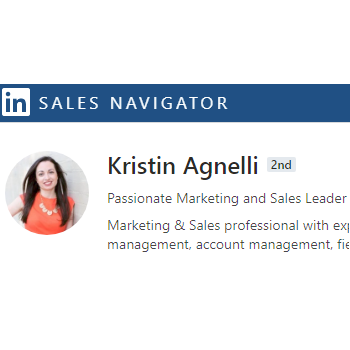 Increase traffic to your LinkedIn profile. Double traffic in a few days. Quadruple it in a couple of weeks. Steady stream of incoming new connections and conversations. Enable TouchPoint for your whole sales team and watch conversations overflow. Track 2nd and 3rd degree connections. You don't need to be connected to someone directly to track their movement. Auto-Attaches LinkedIn-ID - In case your contacts do not have a LinkedIn-ID, TouchPoint uses it's intelligent research technology to find and attach the correct LinkedIn-Id of the contact. Append Missing Email Address and Phone # - TouchPoint comes with a 6-step patented Email Finding technology that gets you verified business email addresses of your contacts. Use this to update your contact list when your contacts have moved to new companies. Recover lost and old contacts - prospect lists and customer lists more than a year old have out-dated contact information. TouchPoint finds the latest information of these contacts and updates them for you. You can export these back to your CRM. Our support is one of the best around. Free Phone and email support available during the subscription period. Paid personalized training is also available. You can get free upgrades to new versions through the course of your subscription. Minor live updates are automatically downloaded and applied by the software. Microsoft Windows 10 Professional / Enterprise (32 bit & 64 bit). Microsoft Windows 8.1 Basic / Pro (32 bit & 64 bit). Microsoft Windows 8 Basic / Pro (32 bit & 64 bit). Does not Support Windows 8 RT. Intel i3 and above recommended. 4 GB RAM or as required by the OS, 500 MB disk space to install the program. 1 GB free disk space to run the application - Campaign data gets collected over many months. Advertise yourself to hundreds of LinkedIn® prospects, every day with eGrabber TouchPoint. Go Ahead – connect with Fresh Leads, send them a message – engage them in a dialog – and close some sales!